Need deals? Then go to Deals! I know it's almost summer... but I'm in back to school mode already! I found some of my best educational deals over the years at Deals. Deals (the discount "dollar" store) is often hit or miss if you actually go into the store. However, Deals does have a website and catalog that you can order from direct. The down side is, you usually need to order in bulk. I had to buy 30+ book bins for my library, however, at a $1 a piece that was much cheaper than any other store around. 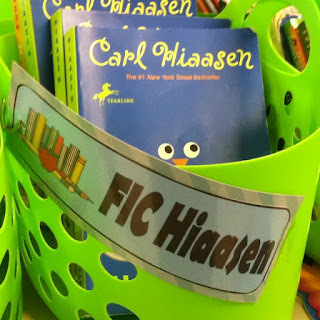 I was frustrated that my old library bins were an assortment of bins/tubs that didn't "match." I was on a mission to coordinate my library and I didn't want to have to go store to store to find matching bins. Through the Deals catalog they came in assorted colors and were ready to be used! I made my own labels with scrapbook paper I already owned to save additional money. I think they turned out super cute! I've used them all this year. 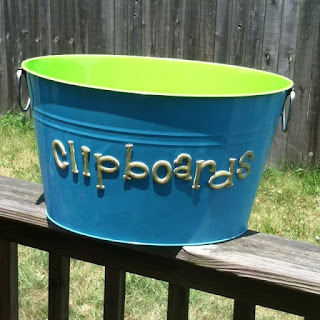 I loved that the bins were flexible (my old bins were too cheap & rigid so the handles kept cracking) plus they have handles for the kids to pull the bins off the shelves. All in all they held up quite well this year! I just need to fix a few tags and make sure books are organized for next year! Another great place to score good deals is... Walmart! If you can have the patience to wait in line, I found some of my best deals at Walmart in during their summer clearance. I found clipboards for $1 dollar. I was able to buy enough for each student if we needed to teach open wall or move around during Reading/Writing workshop. I also found my biggest score a tin "drink" tub to put the clipboards in! The drink tub was originally $9.99 (not a bad price but I like to get things for as little as possible!) after July 4th, I was able to score this tub for 50% off! That's right $4.99!!! I bought a second one that was a different shape to create a space for my poetry picture books. I added scrapbook letters to jazz it up a bit. Shoe String Lesson: Think outside the box when trying to organize your classroom. Often re-purposing "other" items can save you money and be just as functional! Summers are always able to come with a lot of great deals for all the community members. I know its important for all the community members. The pop over to this site is always great for all the community members and other important people.